This illustration shows the scale and comparative brightness of Pluto’s small moons, as discovered by Hubble over the past years. Pluto’s binary companion, Charon — discovered in 1978 — is placed at the bottom for scale. As Hubble cannot resolve surface features on the moons, the textures seen here are purely for illustration purposes. Pluto's moons are even stranger and more intriguing than scientists imagined, a new study reveals. The Pluto system consists of four tiny satellites — Nix, Hydra, Kerberos and Styx — orbiting a "binary planet" comprised of Pluto and its largest moon Charon, which, at 750 miles (1,207 kilometers) in diameter, is nearly half as wide as the dwarf planet itself. "It's a very strange place to live in if you are orbiting a binary planet," lead author Mark Showalter, of the SETI (Search for Extraterrestrial Intelligence) Institute in Mountain View, California, told Space.com. The two researchers used these photos — which captured brightness variations of the moons over time — and computer models to characterize the four small satellites and their orbits in unprecedented detail. For example, Showalter and Hamilton derived new brightness and size estimates for the moons. They found that Nix and Hydra are likely about as bright as Charon, which reflects roughly 40 percent of the light that hits it. Before the new study, "we didn't really know how big Nix and Hydra were, because we didn't know how bright they were," Showalter said. "And now, based on our analysis, we actually do pretty well know how big and how bright they are, so there are a lot of uncertainties about the properties of Nix and Hydra that have gone away now." These diameter estimates assume a spherical shape for the moons, which is likely not the reality; most if not all of the four tiny satellites are probably ellipsoidal, researchers said. This result "took us completely by surprise, because everybody has been assuming all along that the moons would be pretty similar," he added. "They all probably formed at the same time; they all are made of the same stuff." 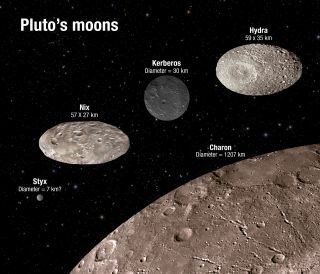 Astronomers think Pluto's four small moons were formed from the debris scattered by a long-ago giant impact between a proto-Pluto object and a proto-Charon. Perhaps the proto-Charon was a very dark body, and Kerberos is a relatively pristine piece of this original impactor, Showalter said, though he stressed that this idea is mere speculation. These illustrations of Pluto’s moon Nix show how the orientation of the moon changes unpredictably while it orbits the Pluto-Charon system. Showalter and Hamilton also determined that Styx, Nix and Hydra are linked by a "resonance," a sort of gravitational sweet spot in which orbits of multiple celestial bodies are related by a ratio of two whole numbers. A similar three-body resonance is found among the Jupiter moons Io, Europa and Ganymede, the researchers said. "The resonant relationship between Nix, Styx and Hydra makes their orbits more regular and predictable, which prevents them from crashing into one another," Hamilton said in a statement. "This is one reason why tiny Pluto is able to have so many moons." But there is also quite a bit of chaos in the Pluto system, imparted by the complex and shifting gravitational field of the Pluto-Charon binary. "If you lived on Nix, you would not know if the sun is coming up tomorrow; it is that extreme," Showalter said, adding that models suggest that Styx and Kerberos are chaotic rotators as well. "You'd have days where the sun rises in the east and sets in the north." Such findings could help researchers better understand the many alien planets that orbit binary stars, researchers said. The new study was published online in the journal Nature today (June 3), just six weeks ahead of the first-ever Pluto flyby. On July 14, NASA's New Horizons spacecraft will zoom within 7,800 miles (12,500 km) of the dwarf planet's surface. New Horizons should get good looks at the surfaces of Nix and Hydra, and the probe's observations will likely reveal how dark Kerberos is, Showalter said. Data from the flyby, as well as continued long-term monitoring by Hubble and NASA's James Webb Space Telescope, which is scheduled to launch in 2018, could end up bringing Pluto's moons into sharp focus, he added.